Can We Be Booted Out of Heaven Like Satan Was? Question: Were angels created on the first day when God made the heavens and earth? Or do we know when they were created? Also, if Lucifer could be kicked out of heaven, is the reason we can’t be kicked out of Heaven because we are sealed with the Holy Spirit? Or when God makes a “new heaven and a new earth” will it be different than the old heaven and no one will be able to be kicked out because there won’t be sin? Or can we be kicked out just like Lucifer was? Answer: We might infer from Genesis 3 that angels were created before humans since we see the devil already fallen and speaking through the serpent in the garden to tempt Adam and Eve to disobedience. Of course, this gets us into questions about whether Genesis 1 depicts 24 hour days or day-ages, etc. If you subscribe to the Day-Age theory of creation I suppose you could have Satan and the other angels created on the first day of earth creation or before and that would be way earlier than humans. Job 38:7 makes it sound like the angels were already in existence and rejoicing over God’s creative work on earth, so my thinking is that they predated the creation of earth. Apparently angels (who it seems are created in God’s image and are each individual creations of God [see below]) included those who were chosen for salvation and those who were not (1 Timothy 5:21). Satan was not, and he chose to rebel against God (though Isaiah 14 and Ezekiel 28 are said by some to refer to Satan’s fall, I think there is good reason not to see it as a direct reference to him). The elect angels could not rebel, and we, as you noted, being sealed with the Spirit, cannot turn away from God either. Heaven will only consist of those whose “spirits” have been “made perfect” (Hebrews 12:23). Many other Scriptures make it clear that we cannot lose our salvation. The new heaven and earth is the place where heaven ultimately will reside. Revelation 21,22 describe the heavenly Jerusalem coming to earth as its resting place, and God dwelling in its midst. So we’re safe in either place. How Do Angels Interact with People Today? Are there any examples of angels engaging in combat in the Bible? Are there any examples of angels engaging in a healing process in the Bible? Do angels deliver messages today to believers and if so, is there a limit here to what messages and could they deliver it through other people? Daniel 10 depicts an angel who came to answer Daniel’s prayer with a message from God. He related to Daniel that the “prince of Persia” resisted him until the archangel Michael’s arrival to help him get free to come to Daniel. It seems the conflict between angels in heaven affects the lives of people on earth. Various political entities have angelic and demonic beings associated with them seeking to accomplish things in and through them. The demonic prince of Persia did not want the angel from God to encourage Daniel, but Michael made sure he got through. In addition to this passage many others speak of angels as the Host of God and angels are seen in battle or ready for battle in such passages as Numbers 22; 2 Samuel 24; 2 Kings 19; and Matthew 25:63 among others. 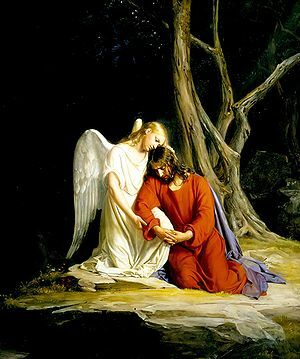 After Jesus’ temptation (Matthew 4:11) and his prayer in Gethsemane (Luke 22:43) angels came to Jesus and ministered to or strengthened him. Angels are seen in Scripture accompanying the Israelites in the Exodus (Exodus 32:34), bringing messages from God (Matthew 1:20; 2:13; Luke 1:11-13, 26-28; Acts 10:3-6; 27:23,24; et al), participating in the last judgment (all through Revelation) and various other activities involving humans. Admittedly, these are few and far between, but they on occasion act on behalf of God to accomplish His purposes. It is entirely up to God as to whether He wants to use angels today to deliver messages to believers and He may indeed choose to do so, as many have attested. Hebrews 13:2 encourages us to entertain strangers since they might be angels. This isn’t the only reason Scripture gives for helping those in need, but it shows us that God may still use angels in this way. The only limit I can think of as to what they might communicate to people is that it cannot be in contradiction to God’s revealed Word in Scripture. As to whether they can communicate through another person, that seems a little too much like demon possession and the Scripture never represents angels as doing that. Are We Being Visited by Aliens? You will notice that in each different perspective the lighted object is noticed by the videographers with a great deal of surprise. If this is a hoax it is hard to explain the unique responses of each different one. However, you will also notice that in one there seems to be a flash right before the “lift off” that is missing in the video taken more close up. What do we make of this experience? Here are some possibilities. It is an elaborate hoax. Several have pointed out issues with the videos that make them think they have been tampered with to make us believe we are seeing a UFO. It is not surprising that people would want to fabricate something like this and go to great lengths to do so. We have had too many such hoaxes perpetrated in the past. It is an angelic visitation. Biblical accounts of angels visiting humans have similar elements to these videos. For example, in Ezekiel 1 we are given a very strange description by the prophet of a windstorm coming out of the north with a fiery cloud containing four strange angelic creatures. The question would be, why are they visiting us, or more specifically, the temple mount, in this fashion. It is possible that God has sent them for some purpose, but so far we are ignorant as to what that would be. It is a demonic visitation. Demons imitate the messengers of light (2 Corinthians 11:14) and would not be above seeking to use some display like this to deceive people who are predisposed to believe that there is an explanation for our universe that leaves out God. Of course, if extraterrestrials do exist, that is, another race from some other part of our universe, they too would have to have been created by God. It is an extraterrestrial visitation. There is nothing in Scripture that precludes the possibility that God created beings in His image on other planets in our universe. Questions would naturally arise as to whether they too sinned as Adam and Eve did, or if they chose better. But if they advanced in their technology enough to travel to our solar system it is possible that they have visited our earth. What their purpose in visiting is would have to be explained by them. It is earthly technology in action. It may be possible that new technology has been developed by our own race that can do what was seen in this video. The last thing we may assume is that this experience, whatever its cause is, is reason to doubt the truth of Scripture. Scripture still gives us our worldview, not experience. And reason tells us that our biblical worldview is the most rational explanation of all that is.